Just Like My Dreams...: New Home Kit Revealed? At the risk of upsetting Ray Winstone and the West Ham United commercial department, here is a sneaky pre-launch look at the new "dicky dirt" for next season, as appeared on several Hammers sites this afternoon. I'm not that convinced by it yet but obviously it will look a lot better if worn by Luis Jimenez and Amantino Mancini come Monday's big launch. I would attribute credit for this reveal but, in the circumstances, repectful anonymity is probably the way to go. I don't think it will look anything like that. You've been duped. Gosh. I hope for our sake that it's a fake. Reminds mr a little of the 85/86 strip - just hope the football is that good! Oh god please no. Its just not a West Ham strip. Hardly any blue and what are those checks? should be more blue, possibly change the sleeve colur, but apart from that it's ok. I hope it is the real one, the nicest kit we've had for ages. Bloody terrible, I hope it's a fake. If that's true, then it's a completely crap kit. West Ham kits are claret body with sky blue sleeves - like Burnley and Villa. And I bet they both manage a decent kit this year. If it's true, then whoever chose it should be sacked or shot. I wouldn't want that kit if it was given away free at the beginning of the first game of the season. well if that's real i hate it, i don'tlike the away strip either, looks like i'll stick with the training top for the season. I love it!! Very retro, football kits we're much better in the 80's and this is spot on! Who cares if the sleeves aren't blue?!? What's wrong with a bit of a change?? I hope this is not the kit, but the new goalkeeper's kit has them checks! Longs its being worn by the almighty hammers, I'll get used to it COYI!! Best kit we`ve ever had and yes similar to `86. 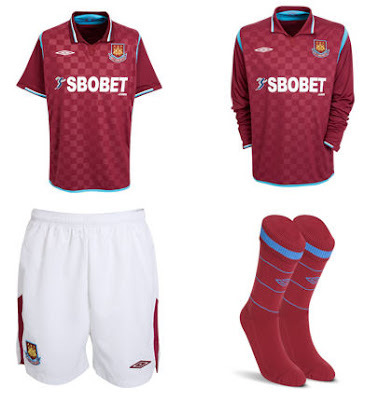 Why can’t West Ham keep it simple, blue sleeves and white socks please! So obviously a fake I can't believe you're all havng the discussion. I hope and pray that's a fake it's hideous! I really really hope thats a fake it's hideous! It's such a bad shirt. The Rangres one is better as it looks like one of their shirts from the 80s. also has a better collar than ours. If ours had the same cut as the Ranger's shirt with blue sleeves, then that would have been acceptable. I like the England home shirt but it seems Umbro have managed to make us look crap. The designer must have been a Spur's fan. Hideous. Who approved this rubbish?? Perhaps the much classier away kit, should be worn at home and this cr*p worn as the away kit (or not at all preferably). The only way to get it changed, is if no - one buys it. Shocking kit, very similar to the 89/90 Bukta piece of shite!!! If you're gonna go retro go back to the 85/86 Adidas Avco strip!!! Is it a 3 year contract we have with Umbro? I hope so as this should be the final season. Bring on Nike or Adidas please. This shirt is terrible. Retro is good but we shouldn't base our shirts on the late 80s. The check fabric is terrible...so naff. Are we going to have shellsuits for the players to run out onto the pitch in? Or how about Upson growing a mullet? Let's pray we play better than we look. We don't play better than we look so far! But the new TQttenham-kit was even uglier (white and yellow)! !